Equal Rights Institute trains pro-life advocates to think clearly, reason honestly, and argue persuasively. I think Richard wanted to interview me because he interviewed me 15 years ago in 2000 on the day that Mary Lightheart climbed the tree which resulted in a 33 day tree sit in Fayetteville, drawing non-stop media attention for that time. I was the one who instigated the civil disobedience after hundreds of other people and I did everything in our power to inspire and motivate the government to make the right decision–to uphold our new tree ordinance. So when I approached Richard with a simple question, “How can we get some media attention for 40 Days for Life,” he invited me and one other person to be on his show. So with no further ado, I present to you the unedited show where Chris and I converse with Richard Drake about 40 Days for Life, Planned Parenthood, abortion, and other related topics. If anyone wants to help edit this so it is shorter and more entertaining, I would much appreciate it. The first time I listened to this speech, I was inspired and uplifted. I started using his approach immediately in my conversations about abortion with great results. The second time I listened, I realized I wanted to memorize this speech. Packed within about thirty minutes of heartfelt, intelligent sharing is just about everything I need to know in order to dialogue and make friends with people who think differently than me about abortion. I highly recommend that you also check out the podcasts he used to do called Life Report. You will need to scroll down to older podcasts to view Josh because he has left this job with Right to Life of Central California to start his own non-profit with his brother, Tim. These podcasts offer you a great education about what is going in in the pro-life movement. Their non-profit is called Equal Rights Institute, and that is a great website to visit for cutting edge training on how to successfully dialogue and make friends with people who disagree with your views on abortion. 40 Days for Life started in the Spring of 2008 thanks to Barbara Durkee and Debbie McGee. The first vigils for the next two years were held in front of Dr. Harrison’s Women’s Clinic near College and North Street in Fayetteville, Arkansas. Read more here. Ray and Natalie Hines of Siloam Springs became part of the first leadership team, and are the only participants who have been on the leadership team since the beginning. 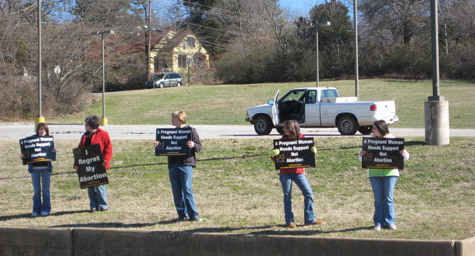 This picture shows prayer warriors in front of Dr. Harrison’s Fayetteville Women’s Clinic, the only place in Northwest Arkansas where surgical abortions were performed. 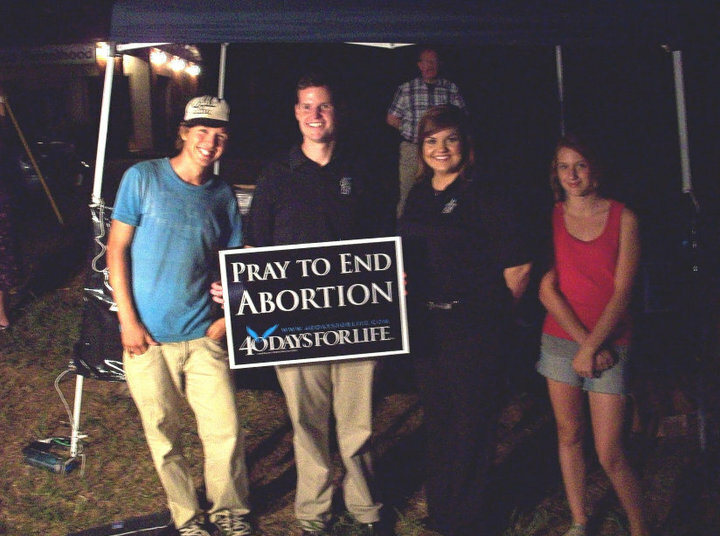 It closed in July, 2010, about two years after the 40 Days for Life vigil began. Read more here. Residents of Fayetteville definitely had mixed feelings. Not everyone felt the same about the clinic. Some people had a gathering outside the clinic to show support on the last day of the closing. I personally know one of the people who attended and promoted the event. Read more here. Juliet Cassell and Tiffany Dickenson were coordinators at this time. In 2011, Planned Parenthood moved to a site near Crossover and Joyce where it would have been extremely difficult for people to stand on public property. Fortunately, by the time the vigil was going to be held, because of the widening of Crossover (Highway 265) by the Arkansas Highway and Transportation Department, 40 Days for Life participants had much more room to hold the peaceful vigil as well as the Kickoff Rallies. Due to generous funding by the city of Fayetteville, sidewalks were installed later, thus making the prayer vigil much more visible to the many cars driving by. At the first Kickoff Rally, sprinklers were turned on the participants, forcing them to cover electronic equipment with plastic and retreat from the spray. Vigils have been held at this site eight times, with the eighth one being the current spring campaign. Police were always consulted before the twice-yearly campaigns were held in order to make sure that all laws were being followed. Then in the eighth Spring 2015 campaign, which is in progress, they were told by the Arkansas Highway and Transportation Department (AHTD) that they could not hold their signs. Here is more information about that situation.